Our product range includes a wide range of stability chambers. 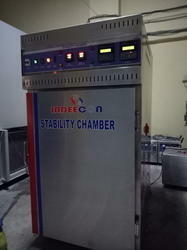 Abiding by the ethical norms of the industry, we are engaged in manufacturing and supplying Stability Chambers. All these chambers are manufactured by using premium quality material and employing latest machines, in tandem with GMP regulations and ICH standards. In order to offer superior quality products to the customers, our experts examine these chambers on different parameters of quality and then forward for the end dispatch. These chambers find their application in conducting stability self-life studies and are appreciated.